Artificial Intelligence: Foundations of Computational Agents is about the science of artificial intelligence (AI). It presents AI as the study of the design of intelligent computational agents. The book is structured as a textbook, but it is accessible to a wide audience of professionals and researchers. The past decades have witnessed the emergence of AI as a serious science and engineering discipline. This book provides the first accessible synthesis of the field aimed at undergraduate and graduate students. It provides a coherent vision of the foundations of the field as it is today, in terms of a multidimensional design space that has been partially explored. As with any science worth its salt, AI has a coherent, formal theory and a rambunctious experimental wing. The book balances theory and experiment, showing how to link them intimately together. It develops the science of AI together with its engineering applications. David L. Poole is Professor of Computer Science at the University of British Columbia. He is a coauthor of Computational Intelligence: A Logical Approach (1998), cochair of the Twenty-Fourth AAAI Conference on Artificial Intelligence (AAAI-10), and coeditor of the Proceedings of the Tenth Conference in Uncertainty in Artificial Intelligence (1994). Poole is a former associate editor of the Journal of Artificial Intelligence Research. He is an associate editor of Artificial Intelligence and on the editorial boards of AI Magazine and AAAI Press. He is the secretary of the Association for Uncertainty in Artificial Intelligence and is a Fellow of the Association for the Advancement of Artificial Intelligence. Alan K. Mackworth is Professor of Computer Science and Canada Research Chair in Artificial Intelligence at the University of British Columbia. He has authored more than 100 papers and coauthored the text Computational Intelligence: A Logical Approach. He was President and Trustee of International Joint Conferences on AI (IJCAI) Inc. Mackworth was vice president and president of the Canadian Society for Computational Studies of Intelligence (CSCSI). He has served as president of the AAAI. He also served as the founding director of the UBC Laboratory for Computational Intelligence. He is a Fellow of the Canadian Institute for Advanced Research, AAAI, and the Royal Society of Canada. 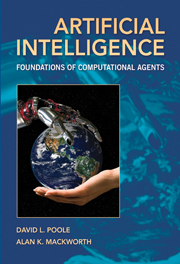 Artificial intelligence : foundations of computational agents / David L. Poole, Alan K. Mackworth. 1. Computational intelligence – Textbooks. 2. Artificial intelligence – Textbooks. I. Mackworth, Alan K.
Cambridge University Press has no responsibility for the persistence or accuracy of URLs for external or third-party Internet Web sites referred to in this publication and does not guarantee that any content on such Web sites is, or will remain, accurate or appropriate. I Agents in the World: What Are Agents and How Can They Be Built? 1.1 What Is Artificial Intelligence?